Preschool Sticker Books - Grow Children's Boutique Ltd.
AMAZING - The Preschool Stickers book is packed with 300+ colorful stickers that will keep your child thinking! These proven activities will help prepare your child for success by using puzzles, games, word searches and much more! 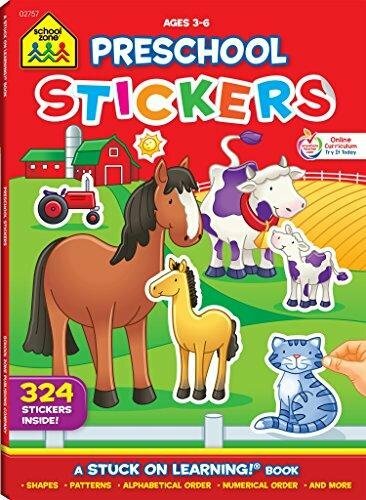 This sticker book is intended for preschool and kindergarten, kids ages 3 to 6, and introduces children to the alphabet, beginning phonics, and early math through playful activities. This unique method of learning teaches skills like ABCs, 1, 2, 3s, beginning sounds, basic geometric shapes and patterns and much more. 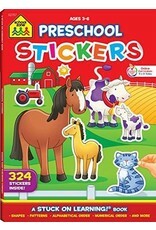 Letter and picture stickers enhance your child's learning adventure. Look for award stickers, too. The sticker workbook contains a total of 64 pages of learning activities and 8 pages of stickers.